Here you will find the perfect place in which to enjoy your Tenerife holiday, where this family run hotel imparts a very special atmosphere. It is run by us, the 3rd generation of the Enrique Talg family. 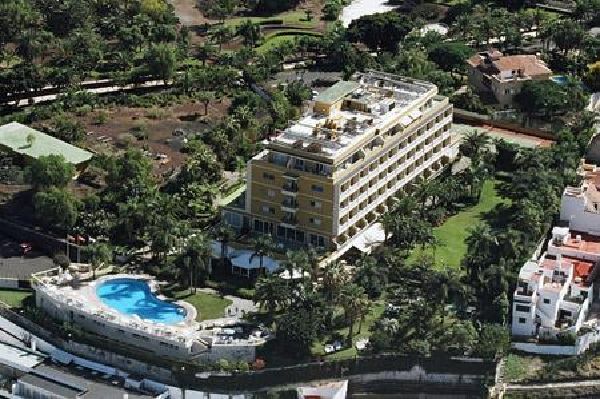 From the tranquillity of the sub-tropical gardens you may enjoy views of El Teide, the highest mountain in Spain, of the Orotava Valley and of the Atlantic Ocean. A walk through the de gardens of the Taoro Park will take you to the centre of the town of Puerto de la Cruz, the Playa Jardín beach and the Sea water pools of the Lago Martinez. The Hotel Tigaiga is certified ISO 9001 and EMAS and is continuously undergoing refurbishment as we are anxious that your holidays on the Canary Islands should be something very special. The 76 spacious, comfortable and perfectly sound-proofed rooms and 7 junior suites will make your stay a pleasure in all senses. Full bathroom with large mirrors, magnifying mirror, bath tub, adjustable shower, hair dryer, bath robe, pool towels, an assortment of amenities and a lovely flower. We like to keep up the standards of a good cuisine. From the Restaurant Tinguaro and its terrace you will be able to enjoy the pleasant gardens and the spectacular sunsets over the island of La Palma. Our hotel is surrounded by approx. 5000m2 of gardens where you will find plant species from almost all over the world. Once a week we organise, at the request of our guests, a guided tour through the gardens. The guide will show and explain the many local and exotic plants we proudly grow in our gardens. Bear in mid we have more palm trees in the garden than beds in the hotel! Our hotel has 4 event rooms to offer. All have direct day light and are sound proofed. Two rooms offer a wireless internet access and a giant projection screen. Seating capacity is up to 80 persons in theatre-style seats. The salons Taoro, Teno and Tamadaya are ideal for private dining or for staff training. Our tennis court is free of charge for hotel guests, it is a hard surface,. Equipment and balls can be hired at the front desk. Our outdoor freshwater pool is heated . Towels and matresses are provided by the hotel. Please keep an eye on your children! Two table tennis tables wait for a small championship to be held. Who will check mate the king? Enjoy a match with our giant chess set. Our sauna with sea view can be booked directly by our guests. The use of the sauna has an additional charge. Towels are provided. After a long day out a relaxing massage will work wonders. Our hairdresser can not only give you a stylish haircut, she can also give you a manicure or a pedicure. Book a date. Tenerife offers you many possibilities to enjoy your holidays, from hiking to water sport activities, theatre and concerts, or just to relax.